Ott DeFoe says his three most trusted lures will work in virtually any condition over the course of the year. 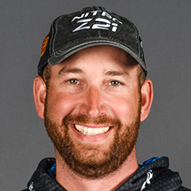 Ott Defoe has scored a Bassmaster Classic Berth every year since he started fishing the Bassmaster Elite Series in 2011. Previous to that, he qualified for the Forrest Wood Cup every year he fished the FLW Tour. No matter what tour he fishes, no matter what lakes the circuits take him to, there is no denying Defoe�s consistency. He knows how to sniff out a bass, anywhere at anytime. With that in mind, the question was posed to DeFoe: Which three lures are his most consistent fish producers no matter the season, location or condition? Defoe starts with a Rapala DT-6 crankbait, a shallow runner that is world-renowned at fooling fish from 2 to 7 feet of water. For his second option, DeFoe picked a popular lure. �My second choice is a shaky-head � need I say more,� Defoe quipped about what is perhaps the best limit filler in all of bass fishing. �I�ve got one tied on at all times. There is not a situation where the shaky-head will not catch fish. Defoe�s best shaky-head rig is either a 1/8- or 3/16-ounce VMC Stand Up Shaky Head teamed with a Bass Pro Shops 6-1/2-inch Fin-Eke worm in green-pumpkin or sprayed grass colors. His preferred set up for the shakey head includes 10-pound braid main line tied to a 10-pound test fluorocarbon leader fished on a 7-foot, 2-inch medium-action Bass Pro Shops Carbonlite spinning rod. Defoe�s top choice for this proven fish catcher is a �-ounce Terminator Jig (green-pumpkin orange or blue olive) trailed with a Bass Pro Elite chunk in green-pumpkin blue flake. 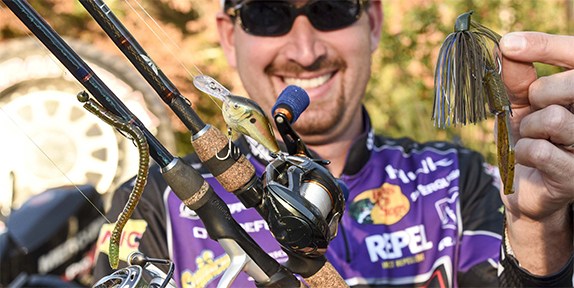 Knowing Defoe is a topwater freak, I asked why a surface lure was not in his must-haves list. �I do love topwaters, but the goal here is to achieve as much versatility as I can get out of three lures,� he said. �And I did not want to burn a choice with a topwater because, in my opinion, a topwater is too limiting. Most topwaters lose their effectiveness in water temperatures below about 52 degrees. But the three lures I picked are all in still in play below 52.